What are some of the challenges faced when carrying out fieldwork in sacred spaces? Find out in this blog by project researcher Dr Tiina Sepp. Registration is now available for the Fresh Perspectives on Pilgrimage and Place Conference taking place on Tuesday 18th and Wednesday 19th July 2017 at The University of York. There are only a few places left, so please await confirmation of your place prior to booking the dinner or making any other related arrangements. What is your favourite part of the cathedral? ‘Is there any one feature or area of the cathedral to which people/you personally feel especially drawn? Can you explain why?’ ‘What is your least favourite feature or area of the cathedral?’ These are some of the questions that we ask people who visit cathedrals or who work and volunteer there. Find out more in this bog by project researcher Tiina Sepp. Christmas has long been associated with receiving ghostly and spectral visitations. St Cuthbert died in 687, but nearly 500 years later he paid a special Christmas morning visit to one of his monks on the tiny Northumbrian island of Inner Farne. We are now into the second year of our project and we have carried out at least one month of fieldwork at each of our case study cathedrals. Among other things, we were interested to see what model of pilgrimage the cathedrals are presenting. We might think of St Francis of Assisi as the original saintly animal conservationist, but while he merely(!) preached to the birds, Durham’s St Cuthbert is popularly believed to have taken steps to ensure that some of Northumberland’s eider duck population enjoyed his personal protection. The Pilgrimage and England's Cathedrals project gallery is now online. 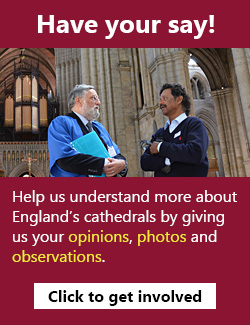 The gallery contains images of cathedrals around the country, and we are looking for people to submit photographs of their own experiences as visitors and/or pilgrims to the gallery to help us understand more about what cathedrals mean to us today. A response to Tiina's blog, exploring some of the ways that medieval pilgrims' experiences might change with the seasons. I set out on my first pilgrimage along the Way of St James in Spain in June 2003 and spent three weeks walking from Burgos to Santiago de Compostela. In November 2004 I returned, eager to experience the pilgrimage in winter, mainly because on my first pilgrimage I had heard several people say: En verano hay mucha gente y poco peregrinos; en invierno hay poca gente pero todos son peregrinos. A look at one of the most popular forms of medieval pilgrimage souvenir: the pilgrim badge. At Canterbury, one such badge depicts St Thomas Becket riding a peacock - what is the symbolism of this odd imagery? At the end of the first round of fieldwork at our four participant cathedrals, Tiina Sepp looks at the topic of saints in light of her experiences of the past few months. John Jenkins looks at Archbishop Robert of Winchelsey, whose tomb was, alongside that of Thomas Becket, the scene of miracles at Canterbury Cathedral during the Middle Ages. My role on the project is to research contemporary models of pilgrimage, and as such I will be conducting fieldwork at each of our four case study Cathedrals (Canterbury, Durham, Westminster and York). As the historical researcher on the project, it will be my task over the next three years to uncover everything I can about the way pilgrims experienced and interacted with our four cathedrals over the centuries.